Big News! Plunderers of the Labyrinth now available on Tabletop Simulator! Players and playtesters, rejoice! After some deliberation, I've decided to publicly release Plunderers of the Labyrinth for Tabletop Simulator. This link will take you to the Steam Workshop page! At last you've found it! The legendary and mysterious labyrinth, rumored to hold many treasures! Unfortunately, you're not alone; you've been followed by other treasure raiders, and you'll have to act quickly and shrewdly to secure the plunder for yourself. 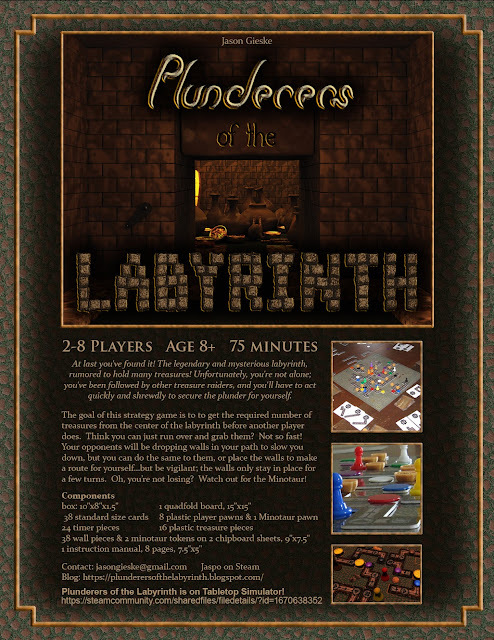 Plunderers of the Labyrinth is a board game I've been developing over the last few years. It is a strategy game for two to eight players in which the goal is to collect the majority of the treasures in a constantly shifting labyrinth. Players place wall pieces to either hinder their opponents or help themselves, but the walls only stay on the board for a few turns. If players get behind they can use the labyrinth's minotaur to try to steal treasures from other players to catch back up. Play time is dependent upon the number of players, with a four player game taking roughly an hour. A two player game has a rather different feel than a four player game, and a game with more than four players is best played in teams of two. Just to note, analysis paralysis can potentially detract from the game experience, particularly with a higher player count, though this won't be an issue for most people. Here's what an eight player team game looks like. This is a prototype; the game hasn't been published or mass produced yet.